Hang on a minute - has the MG F become a classic car? While it may be easy to deride out of hand (or habit), it should not be forgotten just what a milestone the MG F's introduction really was. Because, in 1995, there wasn't much notable about MG; the Maestro and Montego were very much in recent memory, and don't forget the B had been shamelessly resurrected to create the RV8. By the time of the its introduction in 1992, the B had been out of production for more than a decade. Imagine that happening today - if, say, Honda brought back the S2000. But it had leaf springs. And rear drums. So you can see what a breath of fresh air the MG F must have been, with a new engine, look and platform. Furthermore, while the F had its well documented problems, there can be no denying the plaudits it received on launch. 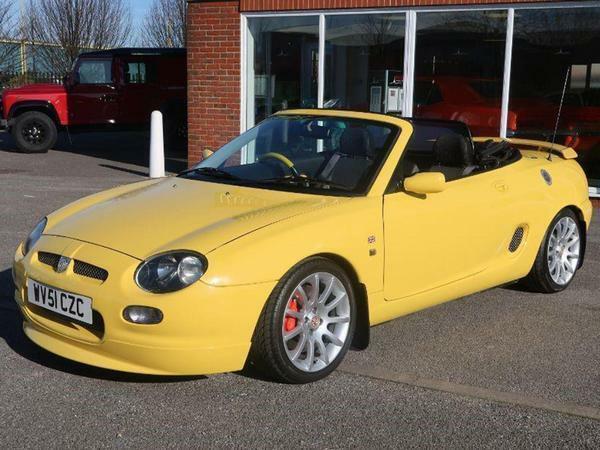 It rode and handled pretty nicely, wasn't too expensive and it arrived at a time when there was still some considerable affection for the MG brand in the UK. For a while it was the best selling drop-top sports car over here; then, when BMW abandoned ship, MG really cut loose (fear of cannibalising Z3 is said to have prevented it beforehand) and created a faster F.
The resulting Trophy followed the recipe that has always proved so popular for sporting flagships: latch it on to a race car programme (in this case the MG F Cup), give it more power, firmer suspension and a bold new look. With 160hp and a 0-60mph time of less than seven seconds, the Trophy gave the F the shot in the arm it really needed after half a dozen years on sale. Given it arrived not long before the F was replaced by the TF, there have never been many Trophys in the UK - HowManyLeft has a peak of 714 in 2003, down to 294 last year. 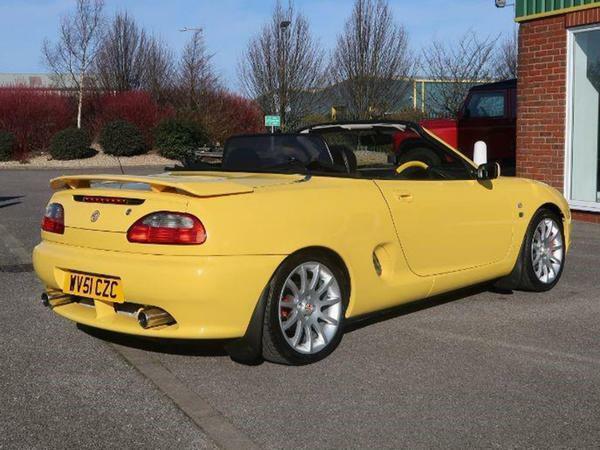 Bear in mind there are still 5,000 regular MG Fs registered in the UK and you begin to appreciate just how rare it is. This one looks a gem, with only two owners from new, 45,000 miles and lots of money spent recently (including on a head gasket and cambelt renewal). And although time may not have been that kind to the F's styling, something this light, revvy and focused in period must feel incredible nearly 20 years later. Back in 2001 the Trophy was criticised for its firm ride; given how cars have changed in the meantime, it would be remarkable if modern tolerances found it too awful. Which means you'd be left with a fast, rare, mid-engined, rear-drive sports car for £5k, and who wouldn't fancy one of those? Looks nice, no interior pics though. Yellow steering wheel is gonna get grubby. I loved my Trophy Blue TF160! I bought an MGTF recently for 500 quid. Mine's the 135 non-VVC version. It's a great little thing. 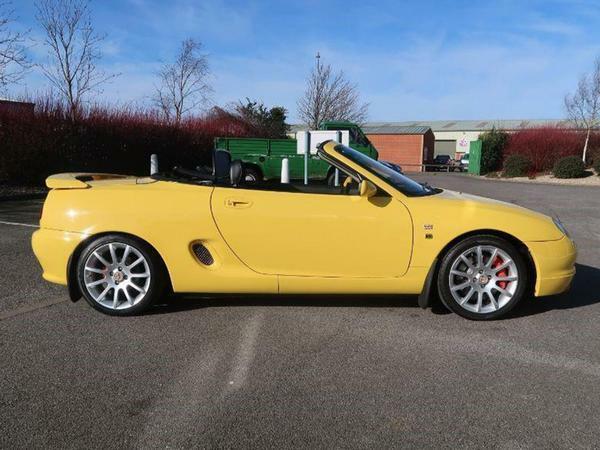 I was looking at these and MX5s but in my price range locally (up to £1500) most of the Mazda's were rusting away at the front chassis rails. It's not faultless (£500, 106,000 miles to be fair), it's a bit tired cosmetically and I replaced the throttle cable as it was sticky which took an hour and cost £60. It was bought as a temporary shed while the wife's car is getting resprayed. I'm now torn between do I keep it, or flog it, but I think the only thing I'd replace it with this be a 160 vvc. Or an XK8, but I don't have the pennies! I think these cars still look great. I had a 160 Trophy engine fitted to my Seven to replace a 1.4. Cost me a few hundred quid and transformed the car. VVC meant it was gutsy low down and flew high up .